I love discovering tidbits of history and then researching to dig up additional information. Recently, I read a post in one of my favorite blogs (Heroes, Heroines, and History) about Ellis Island and the fact that it was used as an internment camp during WWII. With all the research and reading I’ve done about the war, I was surprised I had never stumbled on this fact. 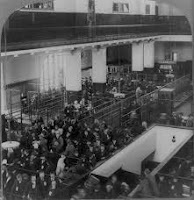 When searching my own genealogy, I started with Ellis Island, but soon found that as some of the thousands of Germans who immigrated to the US, my family came through Baltimore. Perhaps I gave up my study of the Island too soon. The history of Ellis Island goes back to before the colonial days of our country when much of the Upper New York Bay was oyster flats. Samuel Ellis acquired it at some point then tried to sell it without success shortly after the Revolutionary War. Eventually it was leased by the State of New York then ceded to the Federal Government in the early 1807. A fort was erected on it and used during the War of 1812 and remained until 1890 when it was converted to an immigration station. Then, interestingly, and perhaps ironically the port became a detention center during WWII. Immediately following the attack on Pearl Harbor, hundreds of German, Italian, and Japanese individuals were arrested and relocated to the Island. They were detained as being possible Axis spies, saboteurs, and fifth columnists. Many of those individuals were U.S. citizens, and it would be months before they could prove their allegiance and be released. 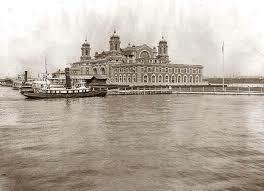 Ellis Island was designated as a permanent holding facility, and more than 8,000 foreign nationals were held during the war. Over 2,500 Germans and their American-born children back to Germany in “exchange voyages” made on Swedish ships. Personal accounts as well as government reports indicate that conditions were not good on the island. Overcrowding, poor food, and poor medical care were just three of issues associated with the detention center. When the war ended, many of the internees were deported, while other remained awaiting their fate and submitting petitions to be allowed to stay in the U.S. The last German internee was released in 1948.